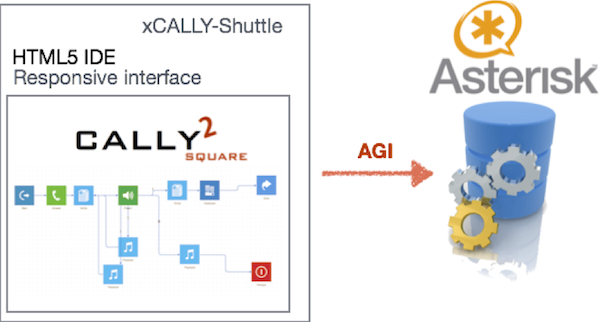 Cally Square is designed to connect via your Asterisk dialplan through a standard AGI interface, providing almost independence from the Asterisk release, easy to be integrated with existing deploymnets and scalability for high performance requirements. Cally Square is tested on Linux CentOS servers with Asterisk 11.X. However it is a general purpose application, so it should be running fine on several Linux distributions and different Asterisk releases. Browse on the xCALLY-Shuttle Web interface and check the Settings section - Asterisk Manager subsection. You will see the below information. Click on the Check Connection... button. You MUST get the below message Connection Asterisk Manager verified! In case you get error to the Asterisk manager connection, double check again your manager.conf configuration and restart asterisk. If you want you can change the default manager user and password. The very important point is you use the same user/password information inside the manager.conf file and inside the xCALLY web GUI Settings, Asterisk Manager section.